Ford sold 9,421 Rangers in the U.S. during the first quarter, according to the Automotive News Data Center. DETROIT — Ford Motor Co. is recalling 3,500 Rangers a month after the midsize pickup went on sale. Ford said the shifter that could move out of park while the engine is off, though it's not aware of any accidents or injuries. The vehicles being recalled were built at Ford's Michigan Assembly Plant between June 4 and Jan. 9. Roughly 3,000 of the vehicles are in the U.S., while the remaining 500 were sold in Canada. The automaker said the affected Rangers could contain bezel wiring that interferes with the shifter interlock override, which could lead to the unintended movement. The automaker sold 2,153 Rangers in North America in January, according to the Automotive News Data Center. 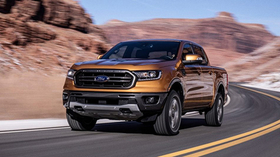 Kumar Galhotra, Ford's president of North America, said strong demand for the pickup is prompting the company to add "massive overtime" at Michigan Assembly beginning this month.